With Disney taking over the Star Wars franchise you can be sure there will still be Star Wars fans in the future - still bitching about how the original trilogy is still the best and how everything else pales by comparison no doubt. In a not too distant future, The Tourist and his travel companion, Mia, are standing on a subway platform with their R2D2 replica droid. They are approached by a Metro City Policeman, who just happens to be a Star Wars fan, and sees an opportunity to recreate a famous scene from the film. Behind the scenes, this GoAnimation is the most spontaneous I've made in a long time. I happened to notice that fellow GoAnimator, RoTV, had made a character approximation of himself using GoAnimates Anime theme and wondered what I could come up with trying to create a version of me. Thus I came up with blonde haired 'Tourist' that you see in my video. I always depict myself wearing suits. I don't know why because I am the person least most likely to wear a suit, unless the occasion specifically says 'formal', then I'll wear the one suit I actually own. However, the final character gave off a bit of a Dr Who vibe to me (it was the suit). Since he is the Tourist, a travelling companion made sense. Mia is what I came up with. 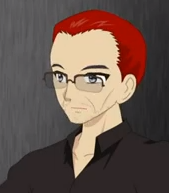 GoAnimate's Anime character creator is very new. The characters you can create are largely based around teen, school age, characters. Mia was my best effort at creating a mature female character that wouldn't make the Tourist look like he had a thing under age girls. My favorite period from Dr Who is Tom Baker's run at the character, specifically the period when his traveling companion was Romana (Romana II, Lalla Ward), a fellow Time Lord from his home planet, Gallifrey, and robot dog companion, K-9. Consequently the Tourist and Mia needed a robot companion along the same line. Solarbaby's wonderful character prop of R2-D2 was the obvious choice without any effort on my part. Why anyone would be travelling with an R2 unit I don't know but it could happen. There are so many replica units around as we speak, maybe the Tourist made his own with future technology that enables it to do everything the original movie R2 unit can? Now I had three characters that I needed to do something with. I put them in a subway scene - thinking, well he is a tourist so maybe he's doing some touring on the subway. Having watched the remake of Total Recall recently, I remembered the robotic UFB security soldiers from that film. 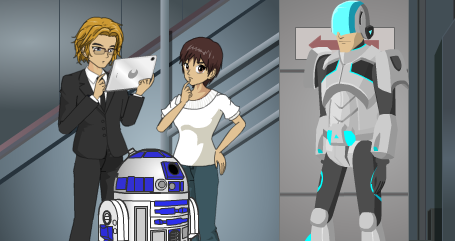 GoAnimate's Space Citizens theme has a soldier style character that could take on a similar role, giving the impression that my characters were on a subway in the future rather than the present. From there it was really a short leap to noticing the similarity to my scenario and that of the famous Landspeeder confrontation between Luke Skywalker, Ben Kenobi, C-3PO, R2-D2 and a Stormtrooper at Mos Eisley. How could a die hard Star Wars fan pass that up?! I pretty much started writing the dialogue to see how the conversation might pan out. The resolution is supposed to suggest that the Tourist possibly has some similar Jedi mind control like ability but a comment by Pitch to the Rhino Productions on the video's GoAnimate page suggests that the Metro Cop picks up on the line "You don't need to see her papers" as a continuation of his attempt to recreate the scene. Hence he's not actually being mind controlled, he's just acting out his scene as planned, forgetting his suspicions about Mia. I like that interpretation better than mine as it does make the scene just a little funnier. You might ask why a mix up in pop culture references would cause the cop to become suspicious. Aside from the fact that there is an obvious reminder of Star Wars in the R2 unit, I was thinking that perhaps such a mistake might indicate that a person is not a local on Earth. Who knows - maybe they have a problem with aliens disguising themselves as humans and a pop culture faux pas could be an indicator of deception. You probably noticed I voiced all three characters. I really don't like asking people to voice my animations. Not the fun little projects like this. It causes delays and you end up with all different levels of recording quality and performance. I figure I'll just start practicing on developing my own voices that have enough difference to register as different people. It kind of works in this I think. So that's the story. No technical magic in this one. Just characters and script. I hope you enjoyed it.